1. 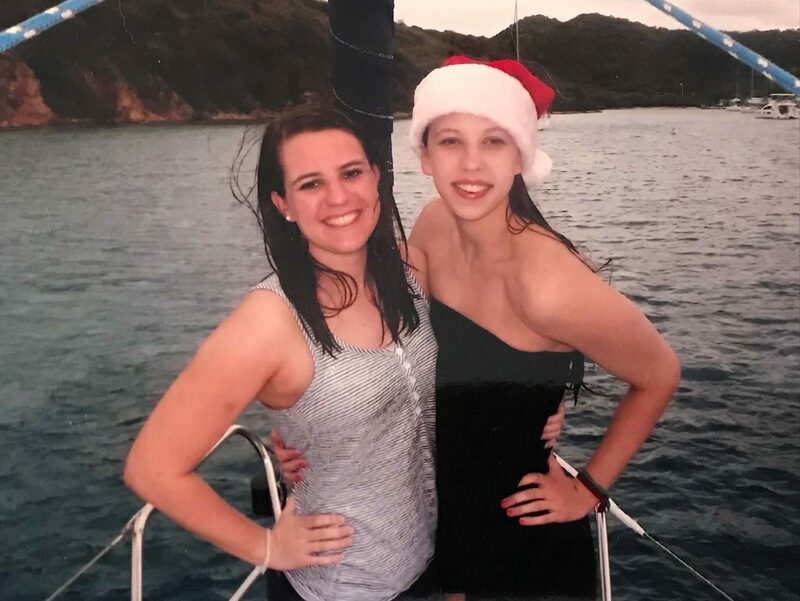 Baker considers her older swimmer, former Washington and Lee swimmer Rachel, "my best friend and biggest support system." 2. Baker possesses enormous self-belief. When dealing with elite athletes, the cream of the crop, you will often find a trait or two that sets them apart from mortals. 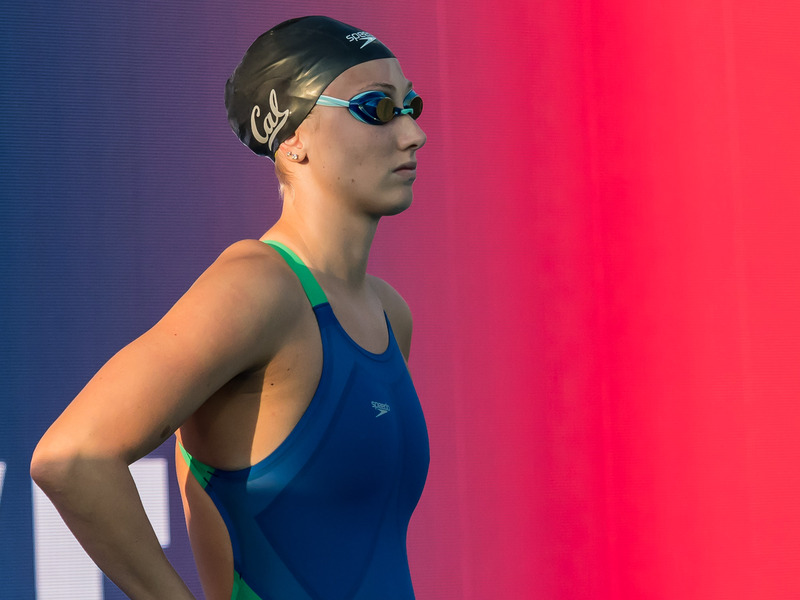 For Kathleen Baker, it's self-beliefrefusing to acknowledge that things might not work out in her favor, even if odds are against her being successful. When Baker was diagnosed with Crohn's as a young teenager, there was no precedent for an athlete overcoming a condition like that to become an Olympic medalist in swimming. 3. Baker knows she can't go overboard in training. Baker admits that even now, it's difficult for her to tell her coaches, David Marsh at Team Elite and Teri McKeever at Cal, that she doesn't feel right and she can't do something in practice. She explained that she either feels good or she doesn'twithout much grey area in between. "Luckily, Teri has known me for years, and Coach Marsh known me for so long," she said. "They will say you can see it in my eyes when I'm not doing well. They say, 'How are you doing?' and if I don't answer, then they know it's not a good day. Instead of doing a killer practice, maybe I'll do something aerobic." 4. Baker's racing strategy has evolvedbut she still goes out really fast. 5. Baker is embracing the 100 back-200 IM double at the World Championships. Baker admits that the timing of the events is not ideal, but she thinks her years in college swimming have prepared her adequately for such a double. And she plans to focus on that back-to-back all year in training. 6. The advice Baker would give to a young swimmer. "Believing in yourself along the way is something that I've really had to have in my life because without believing in yourself, it's really hard to overcome adversity. It doesn't have to be a chronic illnessit can be a shoulder injury or a broken foot or something that like or just being at a plateau. "I think it's just important to always have that confidence and belief in yourself that things will end up okay and you'll be able to accomplish your goals with hard work and determination and just being able to enjoy it." Between Katie's broken neck, Amy's stress fractures and stomach infection, and Kathleen's Crohn's, maybe we should rename the Dream Team to "Team Perseverance". So proud to have all these ladies attend our beloved University! Whilst Amy's stress fractures along with Katie's neck injury have been the subjects of much discussion here, I for one had no inkling of the struggles Amy had to cope with this spring in relation to her abdominal pain. Billy - you're truly a model Golden Bear - we will always root for and support you no matter what... Hey, just keep that shiny golden smile rolling on! Go Bears! Ugh, I hope she gets to blueshirt. Amy has always been my favorite Golden Bear, and Yasss, she will always be that no matter what happens to the rest of her Cal career! Get better Amy!!! A few excerpts from Swimming World...great interview w/Bug, def worthwhile reading the whole article! Ask McLaughlin what she wants to accomplish in her final year as a Cal Bear, and she won't mention times or championships. All that, she has learned, is out of her control. "I just want to enjoy it, and whatever that means day in and day out, that's what it is. I feel like if I say, 'I want it to be the perfect senior year, and I want everything to go well and everyone to swim fast,' that's just sometimes not how it goes," she said. "I think just taking every day and the hard practices, and when it's raining and freezing and we're rolling the lane lines, just kind of slow it down and see how lucky I am to have had this experience. I am going to miss it so much, so I don't want to take any of it for granted because it's coming to an end, and I know when it's done, that's going to be hard. I don't really have a goal because I don't want to define it by, 'It was successful, or it wasn't successful.'" "Yeah, definitely. Just as a college student and especially at Cal, being surrounded by some of the smartest people in school and also the best athletes, the best swimmers in the country, it just gives you a little bit of perspective. And what I have been through with my injury and stuff, I think that also gave me a lot of perspective, figuring out what's important to me. "Swimming is very important to me, and being successful obviously is very important, and I'm going to do everything I can to be the most successful I can. But if not, knowing that that doesn't define me It does matter to me, and that's what important to know, that it does matter to me, and I don't have to be a swimmer or do anything specific just because other people want me to. "That being said, I am on a team, which is very, very important to me, and that helps me also gain perspective. If I want to be better, I'm lifting the people around me, too, and if I see others around me doing better in school and life and as a person in swimming anything, that also can help me. I think it all has given me perspective, looking at the big picture and what I've gained from this sport." "And Teri got named to be one of the coaches at Pan Pacs. I think that was definitely one of the best things for me because with what I have been through and my experience at Cal, Teri has, through the bad and the worst and the ugly and the hard, been with me every step of the way. "It was awesome that when I finally broke back through to where I want to be, she got to be there with me because she has worked just as hard as I have to help me get back on my feet, so I think that definitely was one of the coolest things." "There were definitely some times where it was really hard, and I felt pressure that, if I don't do well, people are going to look bad at Cal or at Teri because I struggled. Looking at the big picture, it doesn't matter what others think. It's really about the people around me who support me. Just taking every day and enjoying what I'm doing and not worrying how that affects the outside world." "I'm swimming next summer for sure because I made the Worlds team, so I'm going to that. And then I'm going to stay up here at Cal and train through Trials at least. I have another semester of school, so I'll be here training and then kind of just taking it by ear then, so we'll see." Great article! Love everything about Katie, and all that she overcome to being such a great Golden Bear. Whether setting up her teammates for success at short-course worlds or basking in the glory of a world record all her own at the U.S. championships, the versatile Baker proved herself as one of the stars of U.S. swimming in 2018. The 2016 Olympic relay gold medalist set a new world record in the 100-meter backstroke at July's U.S. championships, finishing in 58 seconds flat. She followed it up with four medals at August's Pan Pacific Championships in Japan, including gold in the 200-meter backstroke. 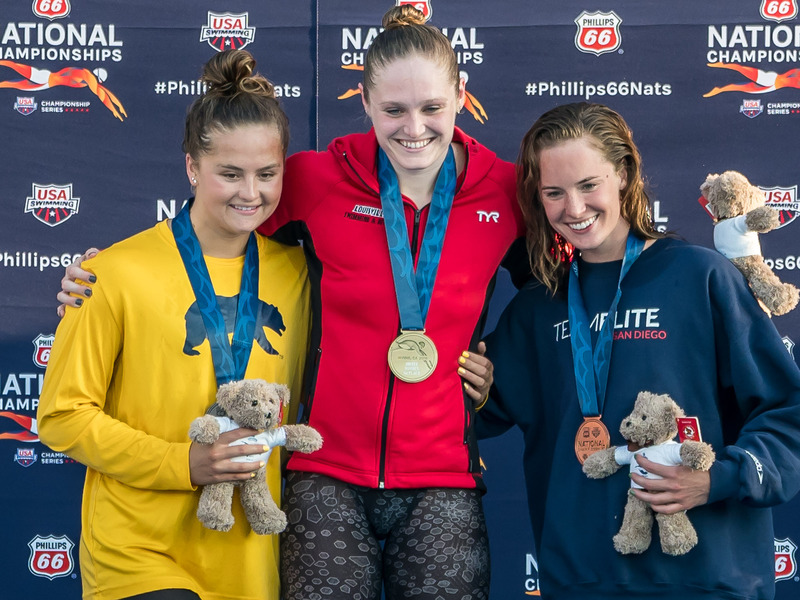 She then hauled in another four at this month's FINA short course worlds in China, including silver for the 200 back and golds with the American medley relays, where she swam in the preliminary rounds. 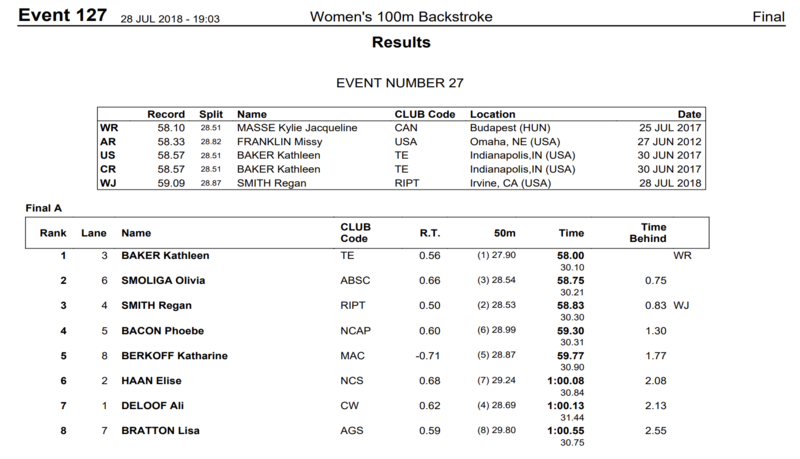 Kathleen Baker 2018 saw newly-minted pro Baker set a World Record in the 100 back with her 58.00 at U.S. Nationals. She also took down the U.S. Open Record in the 200 IM in Irvine. 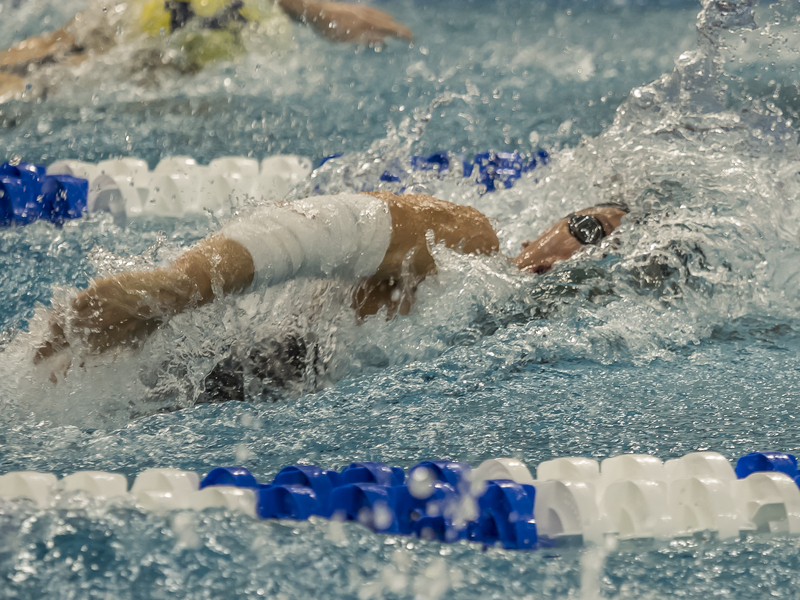 Following that meet, Baker took gold in the 200 back and bronze in the 100 back at Pan Pacs individually and earned 2 relay medals (mixed 400 medley bronze, women's 400 medley silver). During the NCAA season, Baker won the 200 back with a new American Record. 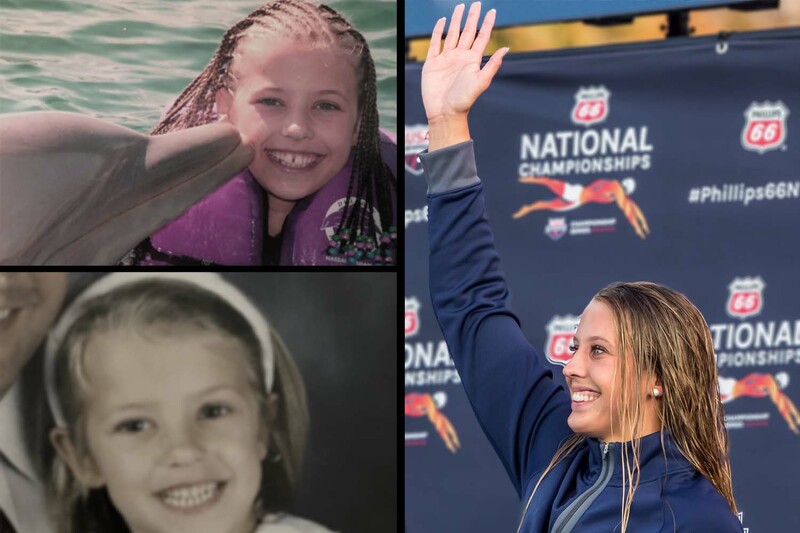 Kathleen Baker is the winner of Swimming World's World Record Performance of the Year after she posted an all-time best time of 58.00 in the 100-meter LC backstroke at the 2018 Phillips 66 National Championships in Irvine, California. Cheers for the most excellent read (pg 30 & 33 of the linked article below), tedbear! But for Katie, it didn't take long for Cal to rise to the top of her college list. Mary and James, though, wanted Katie to see what else might be available and encouraged their daughter to look at other schools. "It wasn't that I didn't want her with Teri," Mary said. "I just wanted her to have the experience of going on recruiting trips and seeing what the options were. If that's where she ended up, that would be wonderful. She was dead set. 'No, this is where I belong.'" Katie did take a recruiting trip to Cal after all, a visit that only reconfirmed her initial sentiment. "Where I've seen the growth is in her ability to get knocked down and get back up," McKeever said. "Not really reinventing herself, but expanding her racing. Getting her confidence back and getting her mojo back has been fun to see. That's mainly been her ability to stay healthy and be consistent in training and gives her confidence when she's racing." Mary McLaughlin clearly sees the maturity and perspective her daughter has gained over the past four years. "I'm proud of her tenacity," she said. "She just keeps fighting, and this sport gives you that opportunity to do that. My husband and I are almost in amazement of her toughness. She just keeps going, nothing stops her. This sport taught her that. She hit some rough times, but it didn't stop her. It put her on pause for a second, but then it projected her forward. I don't know that she would have had that experience without swimming and without Cal really supporting her and giving her those tools. Nobody doubted her. It was a matter of getting through the process." btw, still massively cherish those ever so fond memories of us all dreaming about the DT back in Sept 2014 ... then recruiting weekend came around on the 5th, and lo & behold, all 4 actually showed up on campus to our collective & absolute delight - Oski be praised! Weekend wasn't even over b4 Bears got their very 1st superstud verbal from Bug that Sunday - and the rest is history!!! Great find on Amy's intent to visit Cal, Beardevil! Could Tedbear's dream team actually come to pass, or something close to that edition? I'll be perfectly content if we end up recruiting Kathleen Baker, Katie McLaughlin, and either Abbey Weitzeil or Amy Bilquist, heck I'm not too picky lol! (getting both would be nicer tho haha). Our very first baby bear - #4 Katie McLaughlin! Really fab writeup on Billy, from Swimming World! Amy Bilquist has been a strong female athlete at the nation's highest level, balancing that strength with femininity, something she thinks has been lost in the perception of athletics. The Cal senior is studying marketing and advertising, looking to do something about the misconception that female athletes are either strong or feminine - not both. 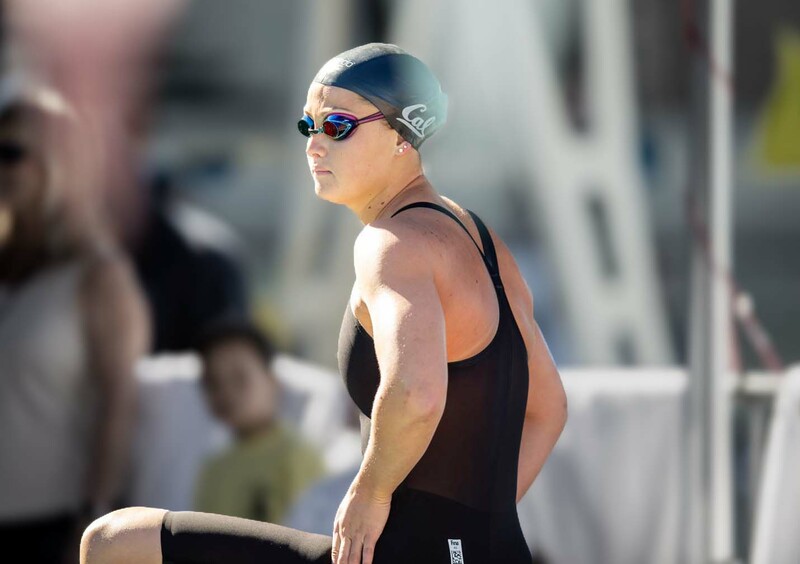 "I want to do something showing the female body in a different light, strong and feminine," Bilquist told Swimming World. "I don't want swimsuit companies to have models in ads instead of real swimmers." 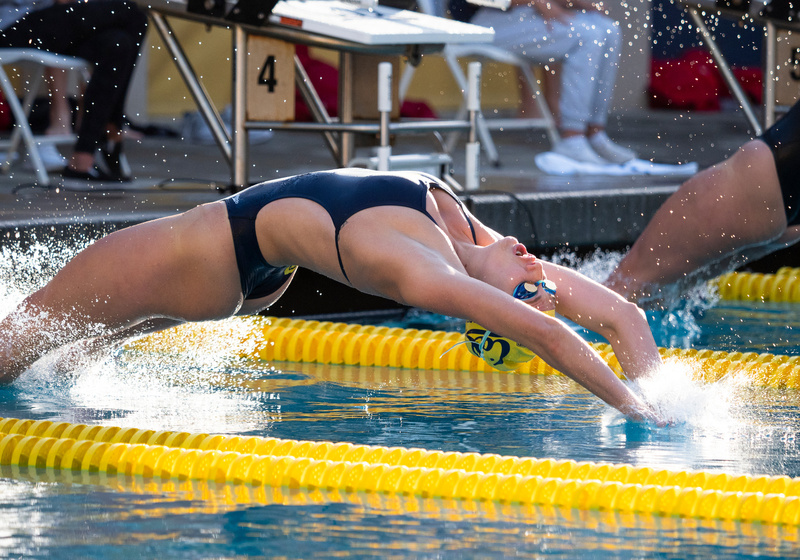 Until that time where she can help invoke change, Bilquist is being a role model in that area herself - and she is determined to use that strength to help Cal aim for a Pac-12 and NCAA championship. "You want to push your ultimate limits. The talent on this team is immense. I think we get looked at as the underdog. But I think if we call perform to our abilities, we can rewrite a couple of record books," she said. "We always think we can get better. That is why this team is so amazing. I don't think there is a ceiling." Bilquist has been a part of two runner-up teams for Cal the past two years and the 6-foot-2 senior from Carmel, Indiana, is poised for a big finish. "It is honestly insane to think it is senior year," she said. "We had our senior banquet and we remember freshman year so distinctly. Freshman year takes awhile then you blink and it is senior year. This it the team that clicks the best. I couldn't ask for a better team going into the last stretch." The chance of going out with her best finish has Bilquist feeling the pressure, in a good way. "I am nervous, but it is a good nervous," she said. "As a freshman, you come in with goals and this is my last shot at a couple of those. I have faced a lot of those bumps in the road. I want to get my hand on the wall and accomplish what I have been trying to for four years." 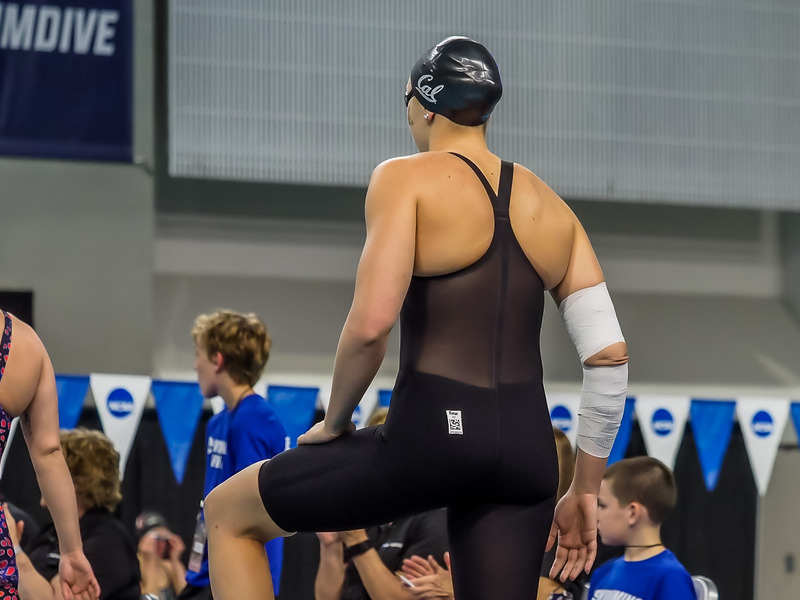 Bilquist was a three-time All-American as a freshman, finishing fourth in the 100 back, fifth in the 200 back and anchored the 200 free relay national championship. It is tough to go up from there, especially with injuries and some other "bumps" getting in the way. As a sophomore, she was in the NCAA "B" final in her events. Last year, she returned to the "A" final, finishing eighth in the 100 free to go along with her ninth in the 50 free and 10th in the 100 back. "I have been left wanting more every season. Personally, I feel like I have never gotten a full season without a bump in the road. So going into this last one, I want to learn from those bumps. If I hadn't faced those bumps, I wouldn't have become as mature of an athlete that I am today," she said. "Every year having to sit out part of the season makes me realize how much I cherish the sport." Relays help her cherish the sport more than any other aspect of a swim meet. Even in her struggles individually, Bilquist has been able to put together some dynamite relay splits. Last year, she was a part of Cal's four runner-up relay finishes. "I definitely think it gave me a boost. My favorite part was splitting a 20.9 on the end of the medley relay (last year), knowing that was still in me," she said. "I would rather show up for a relay for my team. I have had the best times in the NCAA for the relays. Getting up on the blocks with three best friends knowing they are behind you." 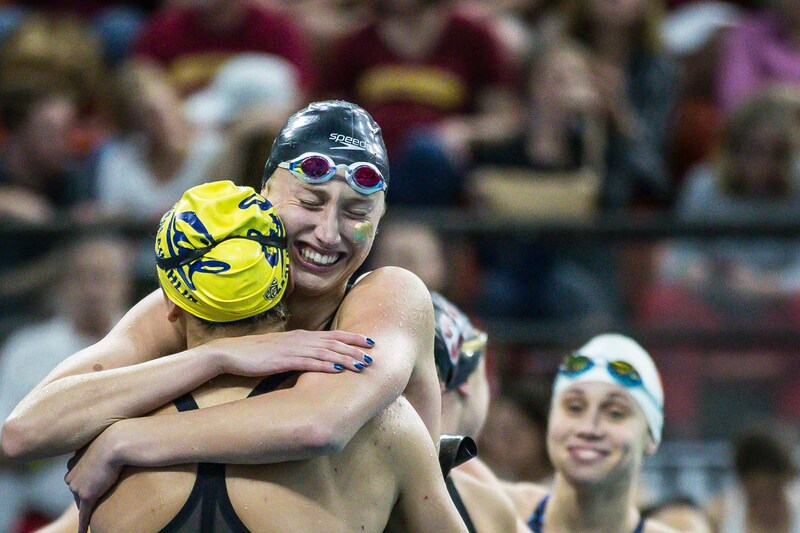 The 20.9 split was specifically monumental to a swimmer worried her best days were behind her. "It was sort of a relief," Bilquist said. "Going into swimming, you are told you might plateau. That gave me confidence that it is still in there and I hadn't peaked. All I remember is Noemie Thomas caching the girl and that I need to seal the deal." Bilquist returns with Abbey Weitzeil, Maddie Murphy and Katie McLaughlin, all All-Americans. But without NCAA champion Kathleen Baker, who turned pro this year, the Bears are definitely feeling like underdogs behind two-time defending champion Stanford. "It is a bit of a Cinderella story," Bilquist said. "Freshman year we were the favorites to win and it didn't happen. We didn't know if we would ever get that chance today. Having a shot at it but being the underdog is (great). For us, things can only go right in this scenario. As a senior, I would much rather be clawing my way to the top. The climb is the most fun. It is really symbolic to what our entire journey has been. There hasn't been a day we can relax, It is the grind, but it is a beautiful grind. 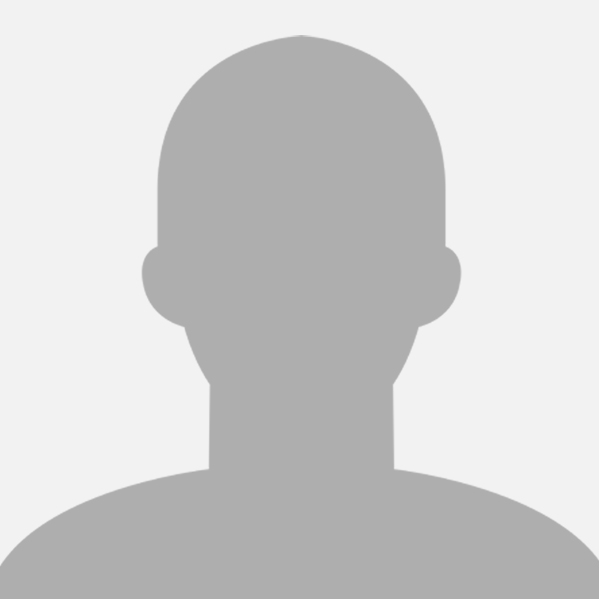 "Yes we miss Kathleen, but as a class, we have been through so much. It is just a celebration for our journey and put everything on the line one last time." "Last year, Pac-12s was amazing and the team had a lot of momentum going into NCAAs. That is exactly what we need to do again. It is the last time that the whole team is going to be together. Our class's legacy more than anything is a graceful perseverance. Knowing that we have all been through nothing that we want to go through. But we went through it together. The team lifted us. We can get through it," she said. "We need to just let it rip." "Dang! 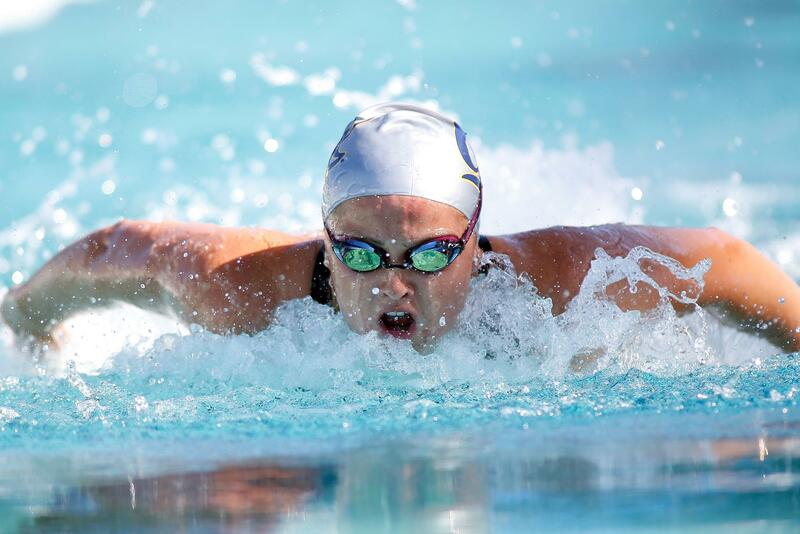 Both of McLaughlin's fly swims this week breaking Cal records from Natalie Coughlin. Definitely a great comeback story from not making NCs her freshman year to taking down an all-time great's school records." "She (McLaughlin) fractured two vertebrae her freshman year. As a senior, she's gone sub-50 in the 100 fly and 1:51.09 in the 200 fly. Dropped a 21.37 split in the 200 free relay this week and a 46.5 split in the 400 free relay at Pac-12. I don't want to speculate where she could have been without her injury, but she's quite a tough swimmer. Amy had a foot injury in the fall that kept her from dual meets. Abbey goes sub-47 on the 100 free after her injury yesterday. I don't really know what to say except that these Cal Bears are tough and just keep bouncing back. They may have lost this week, but they've earned my eternal respect. 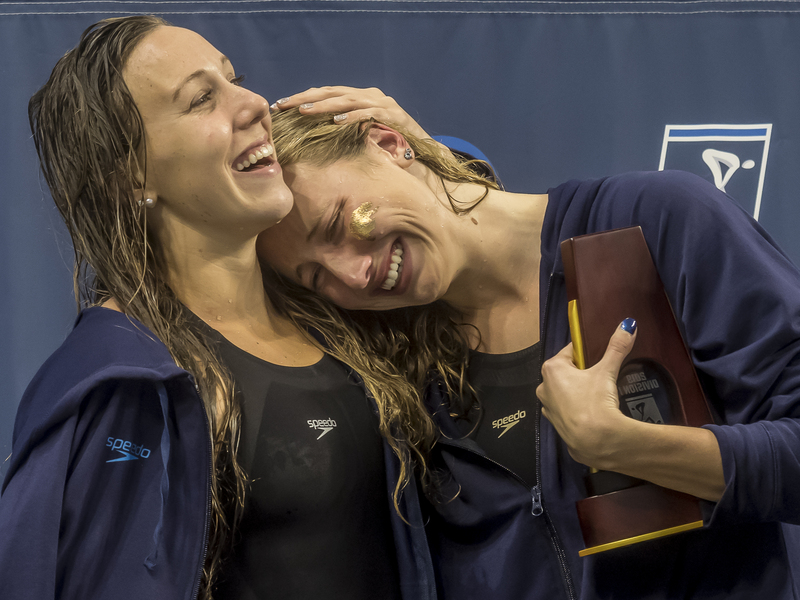 My hope is the young swimmers at Cal learn from these incredible women." "And she's better long course. Hope she carries this to the summer! USA could use an ace #2 100 butterfly behind Dahlia." Without a doubt, the 4th member of the original Dream Team, Abbey, should have been included in this topic, seeing all the adversity that she had so valiantly battled repping Bears in & out of the pool, in her singularly windy & non-linear path to greatness!